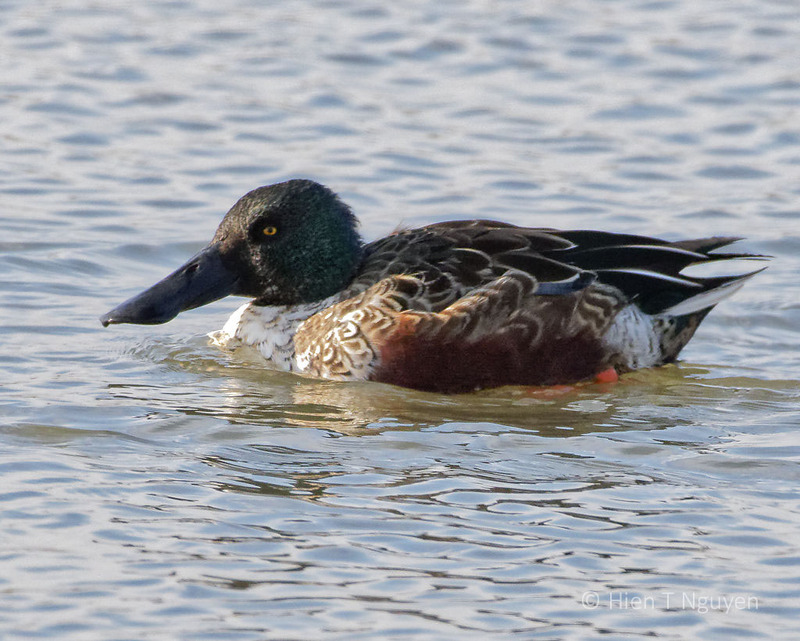 At this time of the year, I often see Northern Shovelers at the refuge. From afar they look like Mallard ducks, but with longer, oversized bills. They dabble back and forth with those bills to catch crustaceans and seeds from the marsh. Northern Shovelers, female and male. 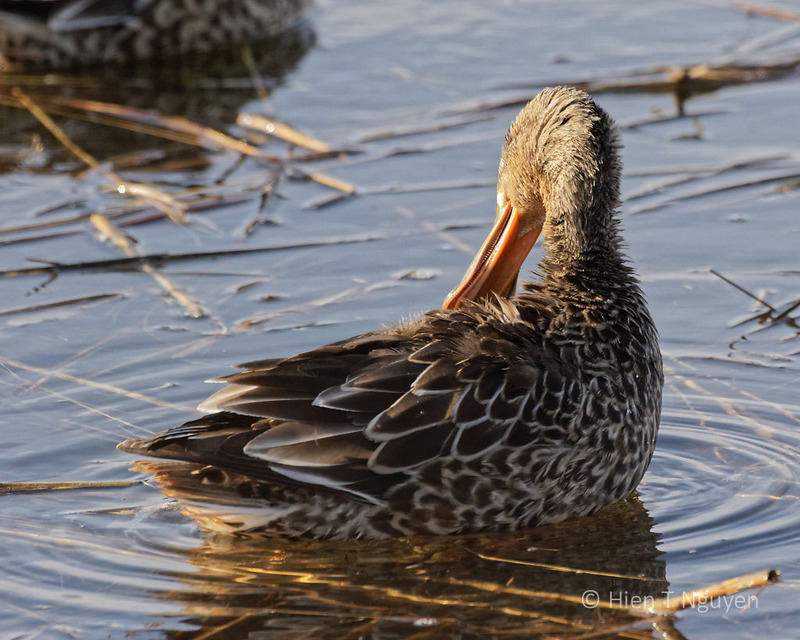 Female Northern Shoveler. Note comb-like filters at the edge of her bill. 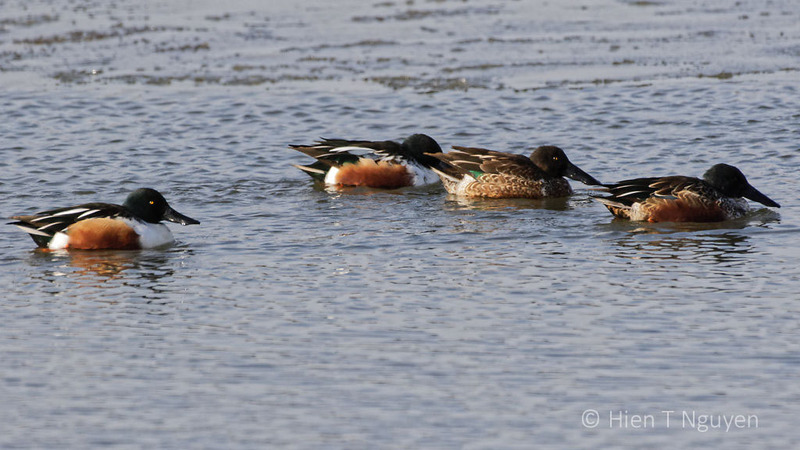 Flocks of Northern Shovelers are known to swim in circle to corral food and make it easier for them to catch. However, I saw this band early in the morning and many were still sleeping. Great captures, Hien. The last is my favorite. Thank you Eliza! You are like many of us, splurging at the end of the year! These are new to me, as well, Will keep an eye out for them. Look for ducks with oversized bills! I have never seen these “shovelers” before – those bills are a great example of natural selection! You have the Shovelers in England also, and in many countries of Europe. Oh really, I didn’t know that. I had to look them up and it seems they live in Eastern England whereas I live in Wales (which is to the far west of England) and sometimes visit West England in winter, so I might see one when I visit my parents in West England! Great photos, Hien. I can see how they got their name! Nice photos of the shovelers! The ones around here this fall have left for the winter. Great photos :-)! I enjoyed seeing the mature and immature Shoveler male plumages (or maybe the ones I think are immature are late molting adults). Beautiful feather details in your last photo. 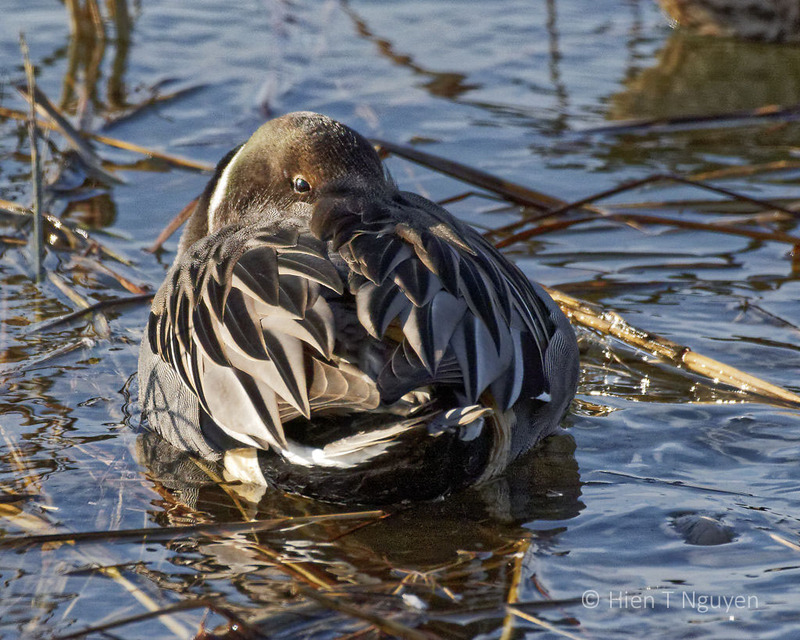 I think the bird is a male Northern Pintail. Thank you Myriam! You may be right about that last photo. I saw her surrounded by Northern Shovelers, and assumed she was one of them. 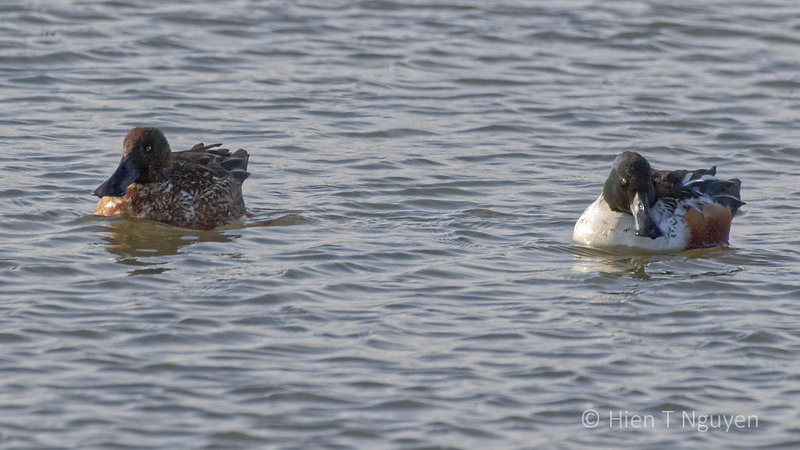 Another east coast memory – Shovelers in winter – thank you, Hien! You should see these ducks on the West Coast also! 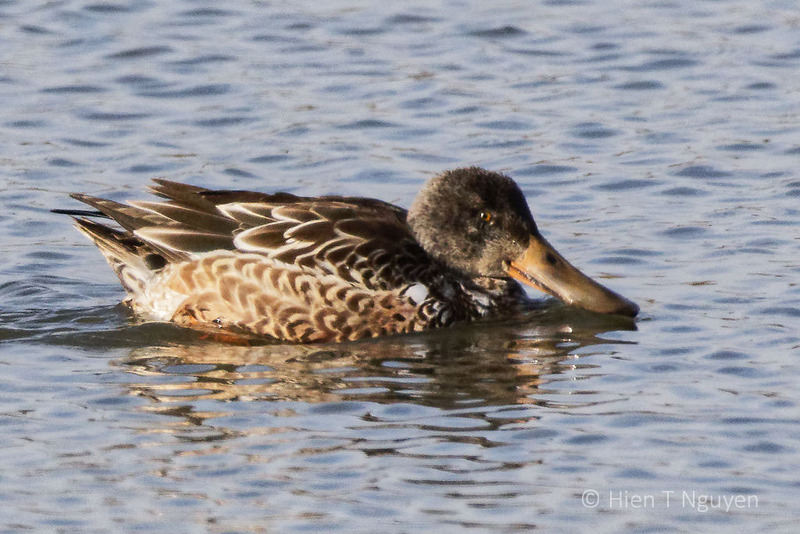 Really liked this northern shoveler series, Hien. I was happy you noted the female’s filters on her bill. Of all the northern shovelers and spatulate bills I have admired in my life, I have never had the pleasure of examining the filters…thank you. You are welcome, Jet! Thank you for stopping by and commenting. I have never seen those, so it was most interesting for me. You write such nice comments with your photos. Thank you very much! Glad you enjoy this post. Thank you very much Takami! These Shovelers exist in practically all the continents, except Antartica.